The following books grow from special issues or essay clusters published in a/b: Auto/Biography Studies or are emergent from projects undertaken by The Autobiography Society. Books published before 2017 can be found in our archives. 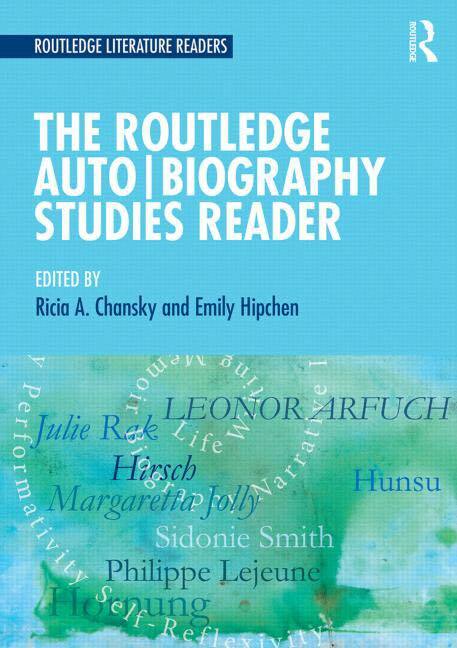 The Routledge Auto|Biography Studies Reader. Ed. Ricia A. Chansky, Emily Hipchen. Beginning with a foreword by Sidonie Smith and a general introduction to the collection, the book is then divided into three sections―Foundations, Transformations, and Futures―each with its own introduction. Significant themes weave throughout the sections, including canonicity; genre, modality, and interdisciplinarity; reclamation of texts; disability and the contested body; trauma; agency, silence, and voicing; celebrity culture; digital lives; subjects in the margins; postcolonialism; posthumanism; and, ecocriticism. Attention has also been given to a variety of methodological approaches, such as archival research, genealogical study, DNA testing, autoethnography, testimonio, and oral history, among others. Reading African American Autobiography: Twenty-First-Century Contexts and Criticism. Ed. by Eric Lamore. Univ. of Wisconsin Press, 2017. This timely volume embraces and interprets the increasingly broad and deep canon of life narratives by African Americans. The contributors discover and recover neglected lives, texts, and genres, enlarge the wide range of critical methods used by scholars to study these works, and expand the understanding of autobiography to encompass photography, comics, blogs, and other modes of self-expression. This book also examines at length the proliferation of African American autobiography in the twenty-first century, noting the roles of digital genres, remediated lives, celebrity lives, self-help culture, non-Western religious traditions, and the politics of adoption. The life narratives studied range from an eighteenth-century criminal narrative, a 1918 autobiography, and the works of Richard Wright to new media, graphic novels, and a celebrity memoir from Pam Grier. This book builds upon the special issue of a/b: Auto/Biography Studies, “The Futures of African American Autobiography” (27.1), which Lamore guest edited in 2012.